Researchers and government policymakers are key players in the world of science policy – but though both are crucial for societal process, they may not understand how best to work together. And that can be a big obstacle to success, one that ASU is working to solve. Fighting that disconnect is the aim of the consortium’s Science Outside the Lab program. The two-week program, held in Washington, D.C., for the past 10 summers, exposes graduate science and engineering to policy analysts, lobbyists, business people, decision makers and program managers – the key players in the science policy process. The goal is to give the students a better understanding of their role in the very complex world of research funding and science policy. But does the program really work? Do the students have a better grasp of the big picture of scientific progress? Have their minds been opened? Reifschneider and Michael Bernstein – a research associate with the Center for Nanotechnology in Society at ASU and a doctoral candidate in the School of Sustainability – set out to answer that. The team knew that a more traditional assessment, such as a pre- and post-test of information or a simple survey, wouldn’t be enough. • The first, a concept map, had students – before and after going through the program – write down the people, organizations and factors involved in shaping science policy and the connections among them. • The second, a burst reflection, had students write down the first five words that came to mind in response to program discussions and activities. The words were scored for their emotional content related to happiness, control and excitement. • Finally, the students filled out a survey before and after the program about their views on the roles of scientists and technical experts in society and of information and values in science policy. 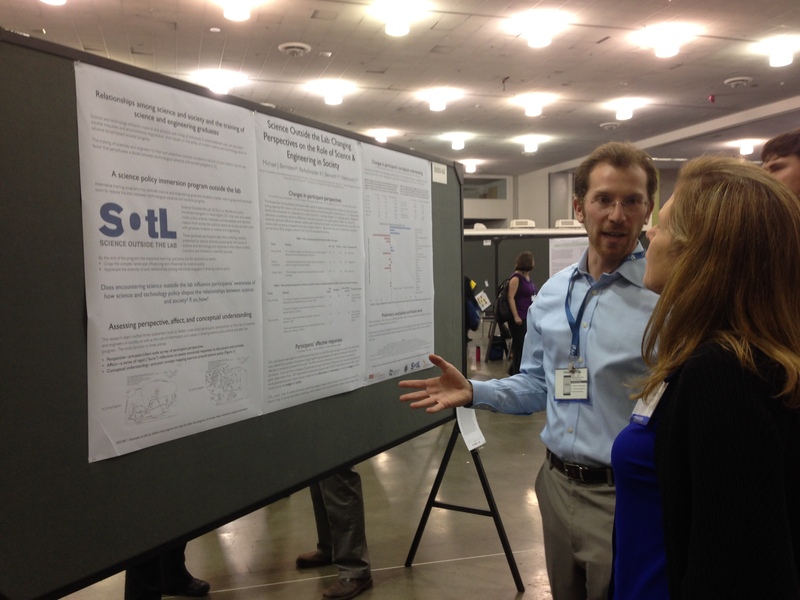 Bernstein presented results of this novel assessment approach at the 2015 American Association for the Advancement of Science student poster competition, where he won the social sciences category. The achievement was announced in the April 3 issue of Science. Preliminary results of the assessments are promising. For example, the students’ concept maps included a more complex web of interconnected nodes after going through the program. Wetmore, an instructor in the Science Outside the Lab program, has long wanted to illustrate with data the radical changes that students go through. Determining whether alternative education experiences, such as Science Outside the Lab, work to improve science and engineering graduate students’ understanding of the policy process is critical to the Center for Nanotechnology in Society’s broader goal of improving outcomes of emerging technologies in society. For his dissertation, Bernstein is developing assessments for this and another alternative training program for scientists and engineers. He and his co-authors also hope to conduct a study that looks at longer-term outcomes of Science Outside the Lab. Researchers writing grants to obtain external funds are needed for a research study examining the effects of grant preparation on scientists' health, well-being and relationships. Researchers who are writing grants to obtain external funds are needed for a research study examining the effects of grant preparation on scientists’ health, well-being and relationships. If you’re writing a grant this semester or in the future, consider joining this study by contacting ASUScientistsStudy@gmail.com. Participants can receive up to $400. This is an ongoing study, so researchers can participate at any time.